Windows Server 2012 Essentials: Transmog to DataCenter? A question popped up on the Windows Server 2012 Essentials forum about Transmog scenarios, and whether a Transmog to 2012 Data Center edition would work. I suggested that i saw no reason why that wouldn’t work. I was wrong. 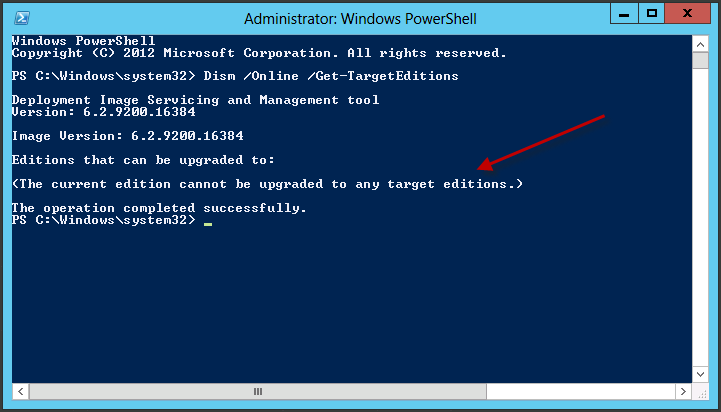 You can see the available target editions for an in place upgrade or ‘Transmog’ by running a simple command. Once we have done the transmog to Standard, you might think that Data Center is then an option. If we run the command again, we see that there is no available option to upgrade to. 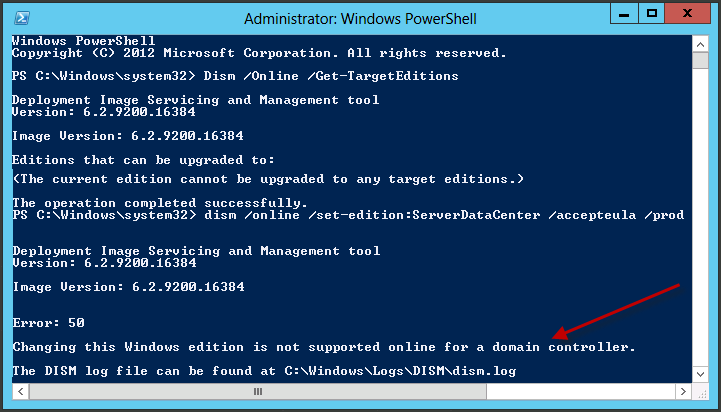 If we ignore that and simply run the command to upgrade to Data Center, we can see an error that it is not supported to upgrade because the server is a Domain Controller. Given the only difference in functionality between Data Center and Standard is the Virtual Machine usage rights you get with your OS license (1+2 for Standard / 1+Unlimited for DC) i can’t think of many scenarios where you would actually want to do this. However, that is not an uncommon reason behind questions in the TechNet forum. Ian Watkins respected member of the SMB IT Community and organiser of the London SBSC User group, points out that the motivation to move to Data Center Edition, is of course to take advantage of the Virtual Machine usage rights. This is indeed the perfect reason to upgrade an instance of WS2012 Standard, to Data Center Edition, however i would again reiterate that whilst this is ok for a base/host server running Hyper-V you should not enable the Hyper-V role on a Transmogged Essentials server.